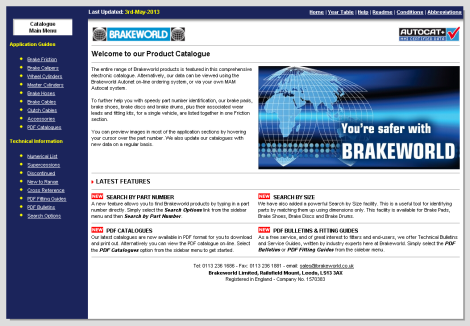 The entire range of Brakeworld products is featured in our comprehensive on-line catalogue. Alternatively, our catalogue data can be viewed using the Brakeworld Autonet on-line ordering system, or via your own MAM Autocat system. To help you with speedy part number identification, all our brake pads, brake shoes, brake discs and brake drums, plus their associated wear leads and fitting kits, for a single vehicle are listed together in one section. You can preview images in most of the application sections by hovering your cursor over the part number. We update catalogues with new data on a monthly basis. Our latest catalogues are available in PDF format for you to download and print out. Alternatively you can view the PDF catalogues on-line. Go to the Catalogue Main Menu and select PDF Catalogues from the sidebar menu. You can view the Sofima catalogue on-line via the link below. This catalogue includes an extensive range of Sofima oil filters, air filters, fuel filters and cabin filters. You can view the Japanparts catalogue on-line via the link below. This catalogue covers oil filters, air filters and fuel filters designed specifically for Japanese and Korean vehicle makes. Pad drawings can be printed out so that you can physically compare a brake pad with a full sized printout. Simply select Print Full Size Image from the top of any of the brake pad buyers guide pages. This feature allows you to find Brakeworld products by typing in an alternative industry part number directly. We have a powerful Search by Size facility. This is a useful tool for identifying parts by matching them up using dimensions only. This facility is available for Brake Pads, Brake Shoes, Brake Discs and Brake Drums. Cross references to other industry part nos. are accessible via the Cross Reference tab under the Technical Information menu. Our latest catalogues are available in PDF format for you to download and print out. Alternatively you can view PDF catalogues on-line. As a free service, and of great interest to fitters and end-users, we offer Technical Bulletins and Service Guides, written by industry experts.